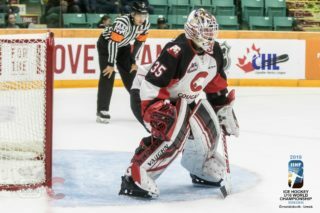 The Prince George Cougars kick-off their three-game Central Division road trip tonight against the Medicine Hat Tigers. The Cougars also make stops in Lethbridge and Cranbrook, as they face the Hurricanes Saturday and Kootenay ICE Sunday afternoon. It’s three games in just two and a half days. Offensive Rhythm: The Cougars have scored just 13 goals in their first seven games and are coming off a weekend where they scored just twice in two losses to Vancouver. Now, as the coaching staff has articulated, it would be more concerning if they weren’t getting chances. Right now, the Cougars seem to be, as the cliche goes, “snake bitten.” Just look at a good chunk of their top-six. Ilijah Colina, Jackson Leppard, Josh Curtis, Vlad Mikhalchuk and Josh Maser have combined for just four goals. Curtis and Leppard have yet to crack the goose-egg and Maser and Mikhalchuk each have just the one goal. Now, this group has had their chances but much like the collective, haven’t found that touch around the net. How do they snap out of the funk? Patience. Sticking with what they’ve have been doing to create chances is key. It’s so easy to get frustrated and deviate, cut corners, cheat for the offence but that more often than not that leads to trouble. The Cougars have to keep pushing, pressuring and attacking the net with a purpose and eventually those pucks will start to go in. Hey, it was a great sign to see Joel Lakusta pot two goals Saturday against the Giants. That surely was a shot of confidence for him and hopefully that has a trickle down effect. 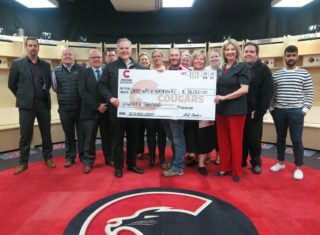 Consistency: Despite two regulation losses to Vancouver last weekend, the Cougars did a lot of good things. The one criticism? Consistency. In both games there was just small stretches where they let the foot off the gas and got away from what they were doing and it burnt them. In the 3-0 loss Friday, it was just a five-minute stretch in the third period where the Giants inflicted all the damage. Saturday, it was a sluggish stretch in the second period where things got away from the Cats. This is a young group. A lot of young players in new roles, dealing with new pressures. It isn’t meant to be easy, that’s what makes the good teams, great- consistency. Can the Cougars have that determined, hard-nosed effort from start to finish tonight? If they can, two points in well within reach. Next Man Up: Josh Maser was handed a four-game suspension for his “slew-footing” major penalty from Saturday’s loss. No doubt, a big hole upfront not having your top goal-scorer from last year for the next four games. It could be easy for the team to feel sorry for themselves, or they can have someone step to the forefront. Who can jump up the depth chart and seize the opportunity? With Maser’s absence, it’s a chance for someone, who may have been down he depth chart, to slide up into a top-six role. There’s always stories of players turning it on and having breakout seasons and these types of opportunities often act as a springboard. Who can help provide a boost with Maser absence? The Tigers are home for two-games this weekend against the Cougars tonight and the Kootenay ICE on Saturday. Medicine Hat had their mini two-game win streak snapped on Thanksgiving Monday, losing 5-0 against the ICE in Cranbrook. That was a three-game road trip, as they posted wins against Tri-City (2-0) and Spokane (3-2) on the weekend. 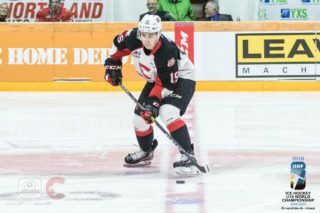 This is a three-game home stand for Shaun Cloutson’s crew, as they face the Lethbridge Hurricanes next Friday, and five of their next seven are at home. A perfect time for them to climb back up the Central Division standings. Things are certainly tightening up in the Central Division, because despite being under 500, the Tigers are just four-points out of first place and in a dead heat with Lethbridge for that third spot. The one thing not working in their favour is games played. the Hurricanes and Red Deer Rebels, the two teams ahead of the Tigers in the standings, have two-games in hand. Medicine Hat did lose two key pieces this off-season in forward Mark Russell and defenceman David Quennville. Rassell led the team with 50-goals and 80 points in 70-games. Rassell’s 50-goals was the fourth-best output in the entire league last season; he’s now aged out. Quennville had 80-points which was the best amongst any defencemen in the WHL a season ago. Though he was eligible to return as a 20-year-old, he’s since joined the pro ranks with the New York Islanders AHL affiliate. They also could have Mason Shaw this year, who missed all of last season due to injury, but he’s also at the pro level with the Minnesota Wild’s AHL farm team in Iowa. Despite what has left, the Tigers still pack an offensive punch. James Hamblin, who was third in team scoring last season, is back and is the team’s Captain. Hamblin had 64-points (21-43-64) in 70-games last season. The Tigers also have Ryan Chyzowski, who had 52-points one season ago, and Ryan Jevne (20-27-47) back in the fold. That’s three of their top-five scorers from the 2017-18 season. Helping mask what they turned over on the blue-line is a solid good goaltending tandem in Jordan Hollett and rookie import Mads Søgaard. 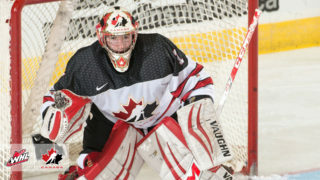 Hollet, who was drafted by Ottawa in 2017, is off to a strong start, posting two wins and a .903 save percentage. Søgaard, who doesn’t turn 18 until December 13th, has had two quality starts to his WHL career. The 6’7 Danish prospect has a sparking .940 save percentage from his first two starts. He’s yet to lose in regulation, posting a 3-2 win over Spokane and dropping a 4-3 shootout decision against Saskatoon. Reports on Twitter Thursday pointed to Søgaard getting the start tonight against Prince George.